Sumatran rhinoceros is one of five rhinoceros who has it own uniqueness. Sumatran rhinoceros is the smallest of five rhinoceros species with their body length is less than 250 cm. Rhinoceros but small one? How can? Theres also another interesting facts about Sumatran rhinoceros you should know! So, what are they? Together with equids (borses, zebras, and asses) also tapirs, Sumatran rhinoceros are the only surviving members of an ancient also formerly diverse group of ungulates which originated in the Eocene around 50 million years ago. Sumatran rhinoceros also the only surviving members of the most primitive group of rhinoceros which emerged during Miocene, which is 15-20 million years ago. Sumatran rhinoceros average weight is 50-60 kilograms, which means 10% of their body weight of plant matter everyday. Because their size is not really large, it make some hunters can catch them easily even they can use their horns as defence. Beside its the smallest rhinoceros, Sumatran rhinoceros also only Asian rhinoceros who has two horns. Sumatran rhinoceros is covered with long hair and thats why they close related to wolly rhinoceros than another rhinoceros which still live until now. Calves of Sumatran rhinoceros are born with adense which covering them and become spased pristly, and almost black when theyre getting older. Sumatran rhinoceros are one of rhinoceros which easy to be hunted because they cant see clearly, which means they have relatively poor sight and theyre rely on hearing and smelling to know whats happen around them. Those ears are the expert part of Sumatran rhinoceros because it can posses a relatively wide rotational range to detect sounds and excellent sense of smell so they know when the predators are around them. Sumatran rhinoceros has suprisingly vocal and can communicate with different sounds and mostly they do that with whistling or whining noises. Dung heaps also be used for their communication, through the large common in territories or the greater one-horned rhinoceros dont occur, probably because of the much lowerdensity of these animals. Like we talk before, Sumatran rhinoceros has two horn (like white and black rhinoceros in Asia and Africa), which is their front horn is usually 25-80 centimetres long while the posterior horn not more than 10 centimetres. Adult males Sumatran rhinoceros can grow up from 2 until 4 metres in length and reach up from 1 until 1,5 metres in height. Their maximum weight was recorded as 950 kilograms which is considerably less than their larger relaties else where in Asia also Africa. Sumatran rhinoceros not only use their horns for defence but also for another things, such as intimidation another animals, fighting, digging up roots, scarping mud from the sides of wallows, pulling down food plants, protect their head and nose when breaking through dense forest vegitation, or breaking branches during feeding. Those horns are made from keratin, a substance wich made those horns to become very strong one. The color of two horns are dark grey to black in colour and in the wild they usually very smooth and from aslender cone that curve backwards. Because Sumatran rhinoceros have larger size than another wild animals, they only have two real predators: tigers who only hunt rhinoceros calves and weak one, also human; like we know who hunt Sumatran rhinoceros for their horns also make them into endangered one now. Lots of people hunt for Sumatran rhinoceros not only for their meat, but also for their horns which can be used for ancient medicine and thats why its still be haunted even already prohibited by governors, even laws. 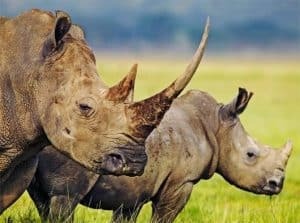 People who hunt for their horns also make them lose their habitat and Sumatran rhinoceros already being estimated if its only less than 300 individuals who still live in the jungles of South-East Asia today. The trade in Sumatran rhinoceros horns between Borneo and other resources in South East Asia area and China has been reported more than 2,000 years ago and this continued until 1995 when they were only about 2,300 Sumatran rhinoceros left world wide. Even now Sumatran rhinoceros hunting is illegal, poaching still continues with this animal be traped and killed for their thorns. As areas of suitable habitat become fewer, the Sumatran rhinoceros population are pushed together into small, fragmented subpopulations that maybe small to be viable. 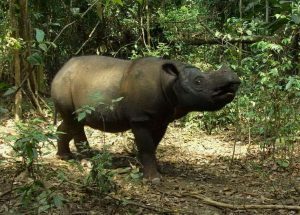 Forest conversion affect to habitat loss for some animals and its also include Sumatran rhinoceros. Bukit Barisan Selatan National Park which now estimated to have largest single population of Sumatran rhinoceros still losing forest cover to do human needs for coffee and rice production. Another biggest threats for Sumatran rhinoceros is poaching, because their horns are still used in traditional Asia medicine for the treatments of variety ailments even the tade is already illegal. Sumatran rhinoceros horns also used in Vietname which showed their status symbol. The horns also sold to Middle East, where it use to make daggler hits. Sumatran rhinoceros is solitary animal who come together with another rhinoceros only when they looking for their mates. The bulls has their own territories approximately 50 square kilometers, and the females has smaller territories which is only about 10-15 square kilometers. They usually mark their territories by leaving excrement, scraping the soil with their feet, or leave distinctive patterns. This species is generally solitary, except for mating pairs and mothers with their young calves. Males Sumatran rhinoceros are primarily solitary, but they also can overlapping teritorries with females which commonly found with offspring. In the wild, Sumatran rhinoceros live at low densities and most are solitary which the females Sumatran rhinoceros have each territorial and avoid to another rhinoceros. We can know whether they’re females or males from their scrapes, sapling, feces, and urine. Their life span estimate about 35-40 years, gestation length of approximately 15-16 months, and age sexual maturity estimated at 6-7 years for female and about 10 years for male. This species is already classified as extinct one in the wild in Malaysia since 2015. The range of Sumatran rhinoceros stretched from India, through South-East Asia and down to Sumatra. But today, the Sumatran rhinoceros only found on the island of Sumatra and Borneo also some in the Malaysia main island. Sumatran rhinoceros total population is estimated fewer than 275 individuals because until early 1990’s the numbers continued declined with estimated loss about 50% or more of the population for decade. Over the last decade, the population is already being increased again because of better protection. Sumatran rhinoceros now occurs mostly in Sumatra, where theres about 170 to 230 individuals and the largest population we can found in Bukit Barisan Selatan, Way Kambas, and Gunung Leuser National Park. There are about 60-80 individuals in Gunung Leuser, 60-80 individuals in Bukit Barisan Selatan, 15-25 individuals in Way Kambas and some Sumatran rhinoceros who reported us founded outside of protected area in Aceh province. This population is decreasing to poaching and need long time to decreased again and high poaching usually occurs in Bukit Barisan Selatan and Way Kambas National Park. Recently, population in Penin Sular, Malaysia is very small but they still can is some areas, like in Taman Negara National Park and Taman in Basor. But it different for some Sumatran rhinoceros in Endau Rompin National Park because they cant survive anymore there. Fortunately, Sumatran rhinoceros population which still surviving is being intensively protected by anti-poaching patrol teams, which are proved very effective due to reducing illegal pouching. The teams are also involved in monitoring Sumatran rhinoceros population with the information gathered being used by Indonesian and Malaysian government to develop effective managemen programmes. Some of programmes involved creating breeding sanctuaries where the Sumatran rhinoceros can be protected and maintained under conditions to success the productive process. The goverment are assisted in their work by several national and international conservation organitation which are also restoring habitat in heavily encroached areas. Sumatran rhinoceros primarily in-habitat is rainforest with lot rivers, large flood plain, or any wet areas with many mud wallows, swamps, and cloud forest. This primarily habitat for Sumatran rhinoceros is rainforests and montane moss forest and occurs mainly in hills area nearby water resources, and exhibit sensational movement, moving uphills in times or lowland flooding. Sumatran rhinoceros also prefer lowland secondary forest, where the canopy is broken also the smaller shuns and dunes on which it feeds are more abundant. Sumatran rhinoceros also depending on salt licks and occurs mostly in primary forest in protected areas but also can be found outside protected area, especially in dry season because Sumatran rhinoceros also looking for their primary needs; water. When Sumatran rhinoceros encountered in the forest, they usually run away and probably mainly accidental because of their limited eyesight. Sumatran rhinoceros is herbivorous animal which means they will looking for food or some leaves in the sub-tropical forest. Not only leaves, Sumatran rhinoceros also eat some fruits, berries, buds, or even flowers which can be found by digging up the ground using their horns. Sumatran rhinoceros eats variety types of plants in the tropical forest, start from secondary vegetation created by land slide until tree along river banks. Sumatran rhinoceros can run very fast and are very agile, which they can climb mountain easily also can negotiate very step slopes and river bank. With the protection by their horns and hard skin, its also cartilage on head and nose , they can easily bread through densest vegetation. When they run, they’re very agile and fast which they can run until 40 km/h. 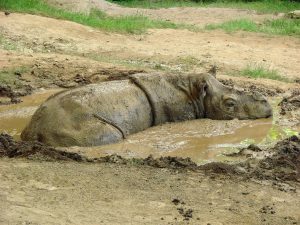 Sumatran rhinoceros needs to keep cool during the day so they spend their day time in water or mud, or often in wallow create by their self. Sumatran rhinoceros spend their most hours in wallowing in mud holes and they may use it for temporary pools and puddles for deepen their feet and horns in mountain areas; good places for wallows are scarce and some are use repeatedly for a very long term and eventually become characteristic holes dug in several meters into slope. 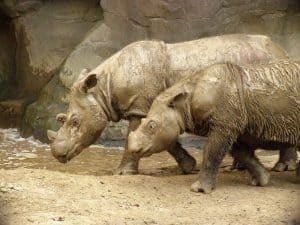 The female Sumatran rhinoceros will give a birth after gestation period, which usually last over year long and Sumatran rhinoceros calves will follow their mother until at least two years old or when they already big enough to become independent one. Sumatran rhinoceros give births every 3-4 years and usually calves are born from October to May with the region’s rainy season. Calves will follow their mother at 16-17 months and will live solitary after that. 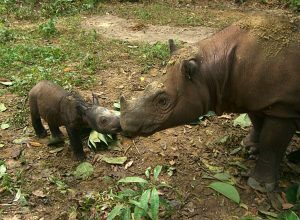 Sumatran rhinoceros calves often attacked by wild dogs or tigers thats why they wiill stay with their other until 16-17 months old. Nothern Sumatran rhinoceros (dicerorhinus sumatrenis lasiotis). This species is roamed in India and Bangladesh and declared extinct in those countries. Its the largest among another two subspecies. Meanwhile, the status of Sumatran Rhinoceros are already under endangered status in the world. Probably, There are not much existence of Sumatran Rhinoceros except in Indonesia, there are reason why Sumatran Rhinoceros are being endangered. One of biggest threats for Sumatran Rhinoceros existence is poaching. Why? cause Sumatran rhinoceros has a best horn, then their existence disturbed human agricultural development. Therefore, if the existence of Sumatran Rhinoceros are decreased, it goods for increasing human agriculture sectors. On the other hand, the horn usually used for fever and pain medicine in all over Asia. Then, trade of Sumatran rhinoceros has been issued since more than 2,000 years ago till now. In addition, over the centuries, the place where they are still can be found these days is only in National Park or wildlife reserves. With endangered status, Sumatran Rhinoceros are continuously under eye of protection, especially for WWF. Therefore, we hope that we can decrease the loss of habitat to maintain the existence of Sumatran Rhinoceros. 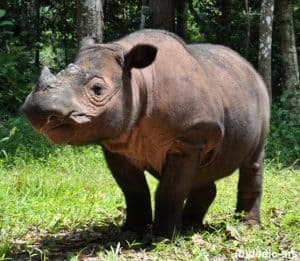 Thats what we should know about Sumatran rhinoceros and its our responsibility to take care our nature so Sumatra rhinoceros would not become extinct and our grandparents still can meet this unique creatures. So, save the nature from now!